Every time I've followed a pattern that has welt pockets, it seems that the directions for them are all different. I also have a hard time remember how I did it last time, so that every time I make a welt pocket (and here I'm talking about single welt pockets) I have to learn how to do it all over again. This time, since I'm drafting my own pattern and can make the pieces however I like, I'm going to follow the method set out in The Victorian Tailor. The author gives two methods, but this is the one which he says is used most often after 1850. 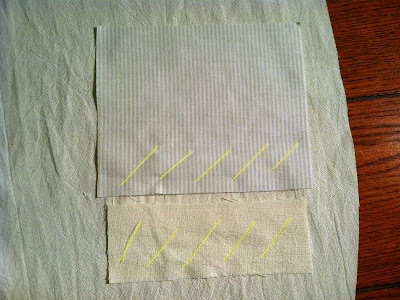 In my pictures, since I wasn't thinking at all and used white thread against tan fabric, I've highlighted the stitches. 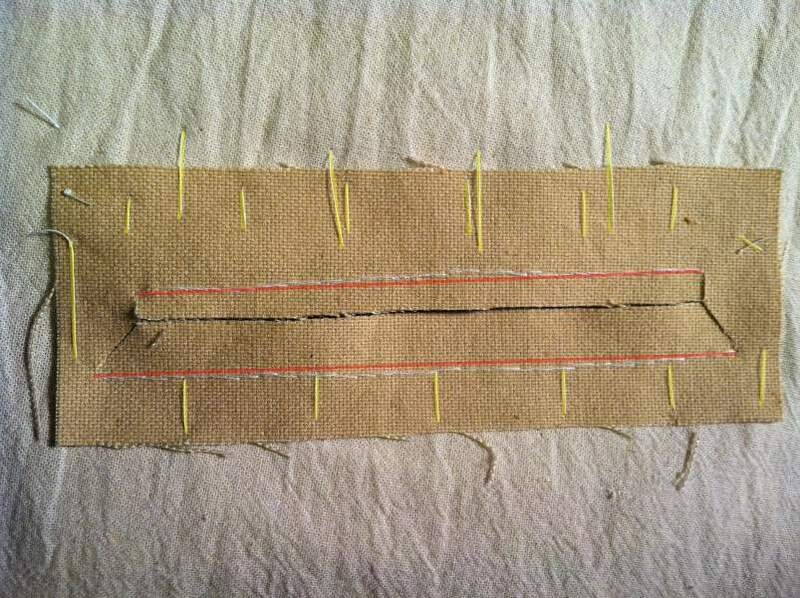 I used yellow for basting stitches and red for final stitches. Here is the piece to which I'm adding a welt pocket (the muslin for my waistcoat). I've drawn in chalk where the welt should go, with a line through the centre which is where the opening will be cut. As with almost all of the photos on this blog, you can click to enlarge them. These are the pieces which will make up the pocket. 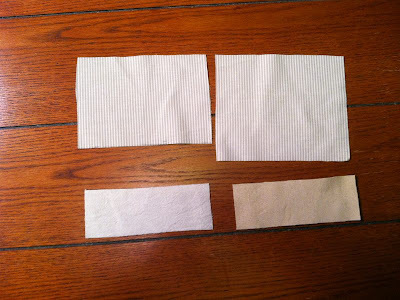 The two top pieces are the pocketing. The left piece is for the bottom pocket, and the right is for the top. It is longer by the height of the welt (the height of the box I've drawn on the piece above). The bottom left is the welt itself, and the bottom right is a scrap of canvas I've cut to 1" longer than the finished welt. The canvas is basted to the wrong side of the fabric. Luckily the muslin is thin enough that you can see the outline of the canvas through it. I also should have ironed it. The welt is basted to the right side of the fabric. 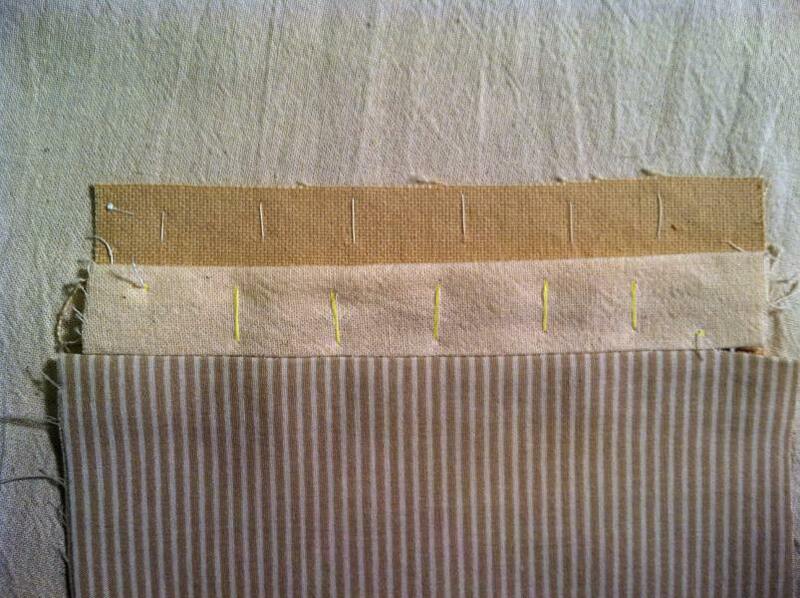 My seam allowances are all ¼", so I line up the welt so that the seam line lies on the bottom chalk line. 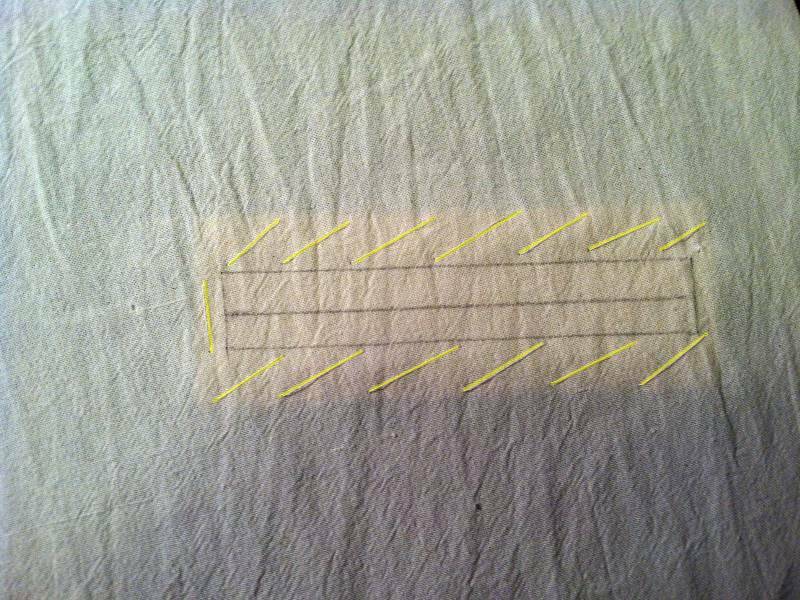 I then baste the top pocketing fabric, right side down, so that the bottom edge lines up with where the pocket opening will be cut. This is lower than the top chalk line. 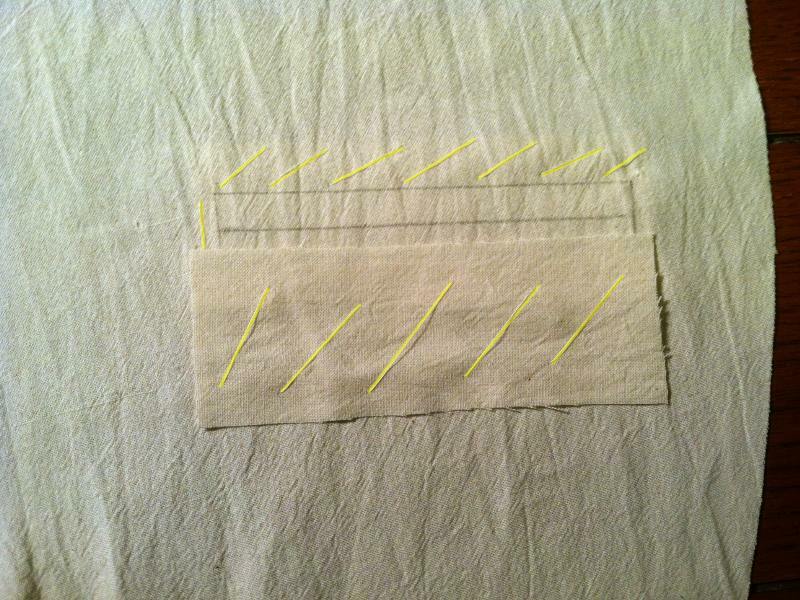 Sew the seams for the welt and pocket. 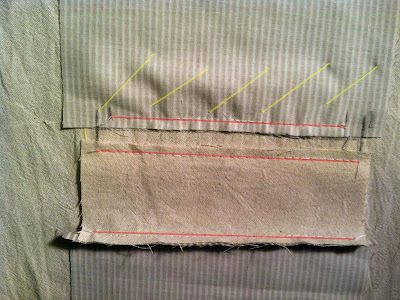 The welt seam goes from edge to edge of the chalk marks. The pocket seam ends ¼" inside the lines on both sides. Not to the edges. Take the basting stitches out of the welt, and sew the bottom pocketing to it, right sides together. It won't lie flat, as shown below. 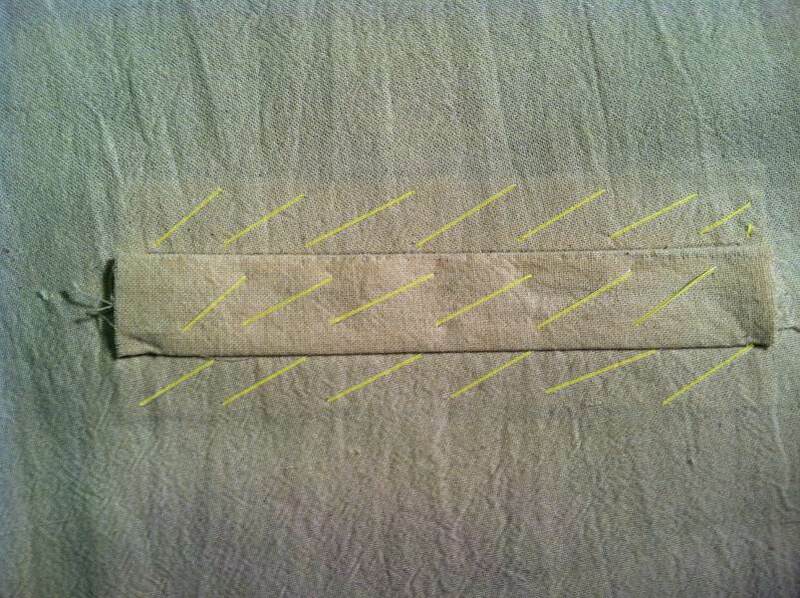 This seam is the same length as the other welt seam - the total width of the pocket. Notice that the pocketing is ¼" wider than the welt. This is true for both pieces. This is now what the right side of the fabric looks like, with all the pieces sewn in. And this is what the wrong side looks like. Notice the basting stitches still in place. Now we will cut the pocket opening. Unlike any other welt pocket directions I've seen, this pocket is asymmetrical. It actually works out extremely well that way. 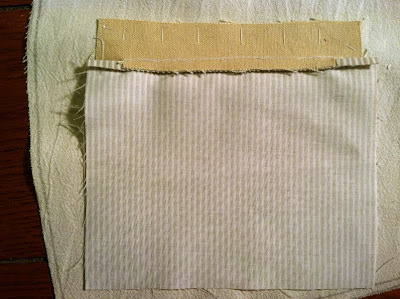 Cut the opening the same width as the width of the pocketing seam. Cut straight up from the opening to the seam ends. Do not cut into the pocketing! 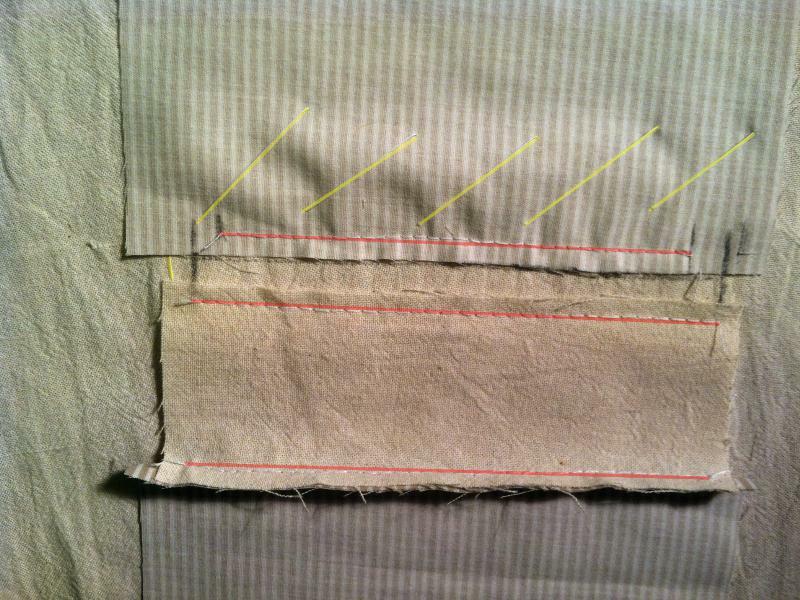 Cut at an angle down to the seam ends of the welt. Do not cut into the welt! 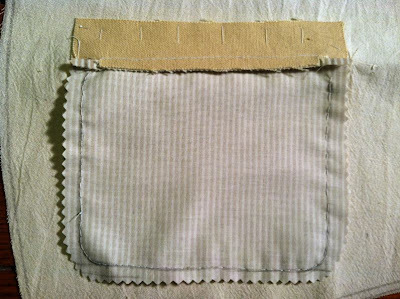 The pocket opening slit should only cut through the fabric and the canvas. 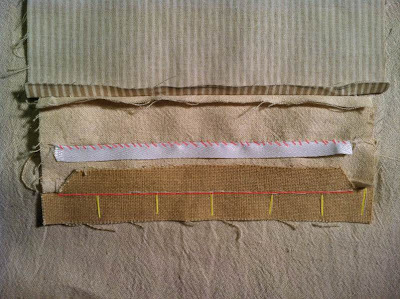 Fell stitch a piece of linen stay tape to the centre of the welt. I've folded the welt in half to find the centre. Try to make the stitches as small as possible so they don't show on the right side (though if they do they'll look like prick stitches, so it probably won't be that bad). Fold the welt down (still from the wrong side of the fabric) and baste in place. 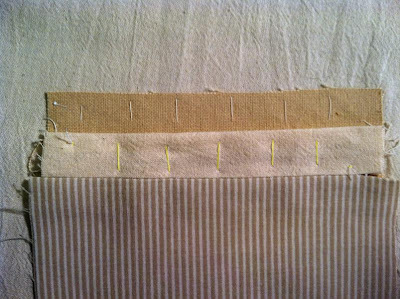 You can see the basting stitches still in the canvas we basted down in the first step. This is a good time to press everything with an iron. The seams for the welt get pressed up into the welt on both sides. 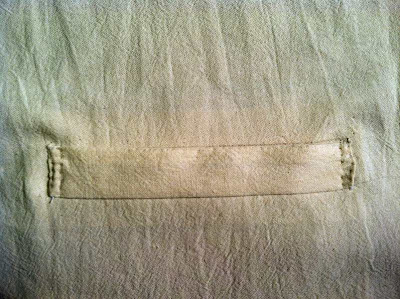 The seams from the pocketing get pressed toward the pocketing on both sides. 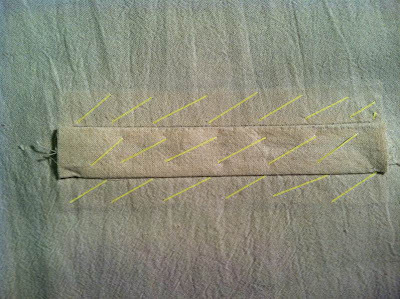 Push the welt through the pocket slit to the right side. Make sure it sits neatly on top of the fabric with no puckering. You'll see that because the pocketing is sewn to the welt ¼" from the edges, the welt will sit on one side of the slit and the pocketing on the other side without any bunching. This is what the back looks like, all neatly arranged. 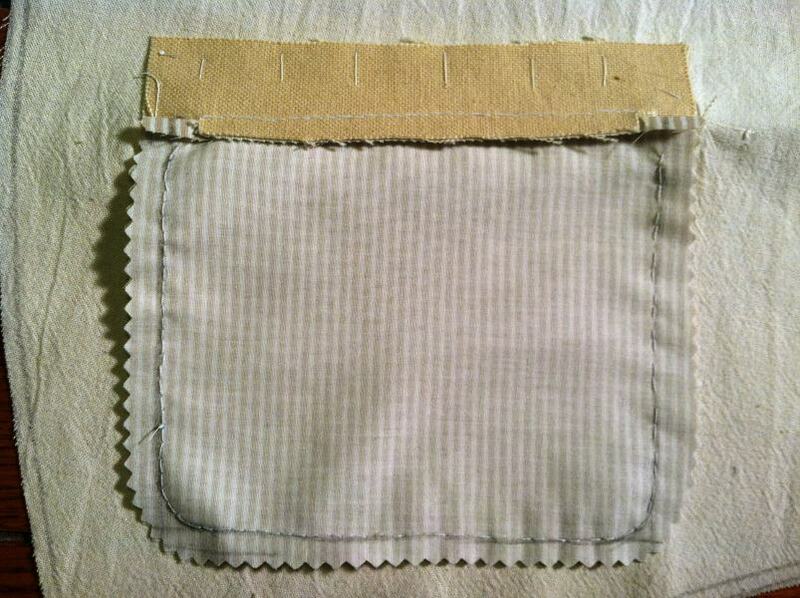 Once again the top pocketing sits nice and flat, lying on top of the bottom pocketing. 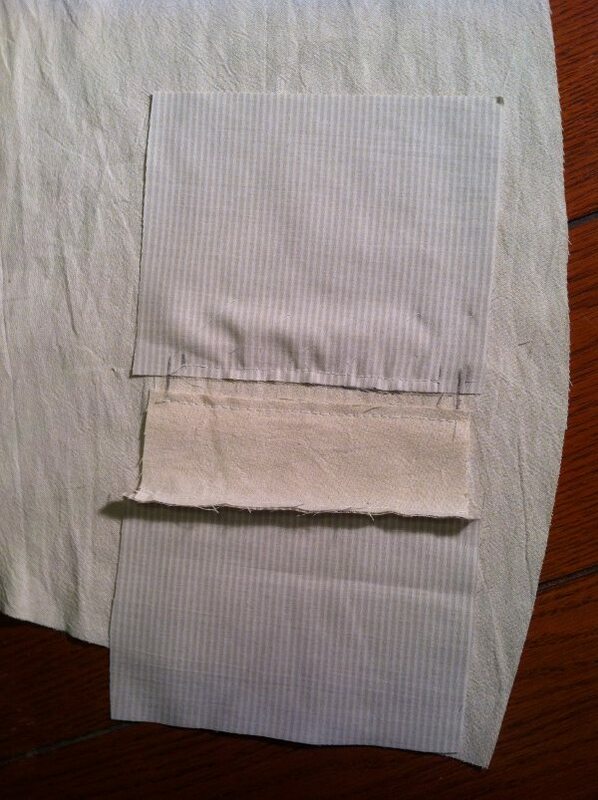 Sew around the pocketing in an appropriate pocket shape. You can use back stitch or running back stitch. 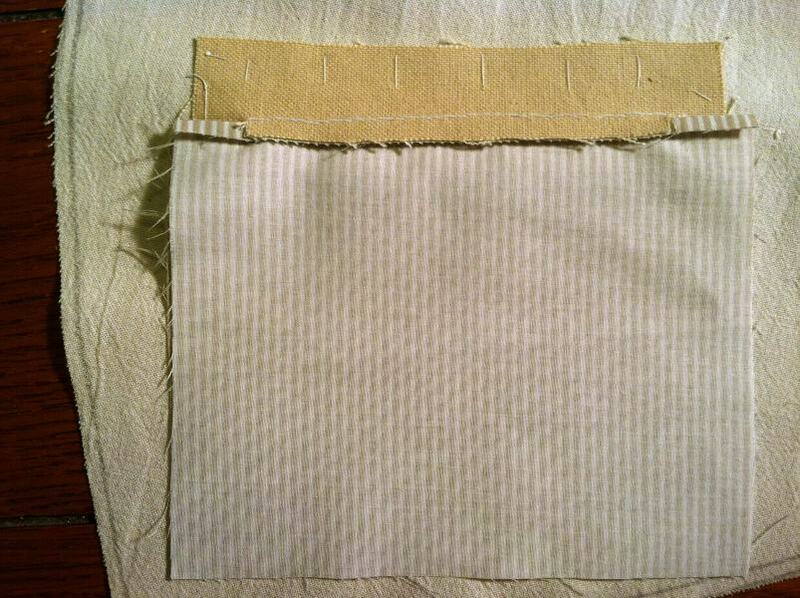 Make sure that the bottom isn't so long that it will interfere with the bottom hem of the garment when you finish it. I've pinked the edges so the pocket doesn't fray, but that probably isn't really necessary. STOP! 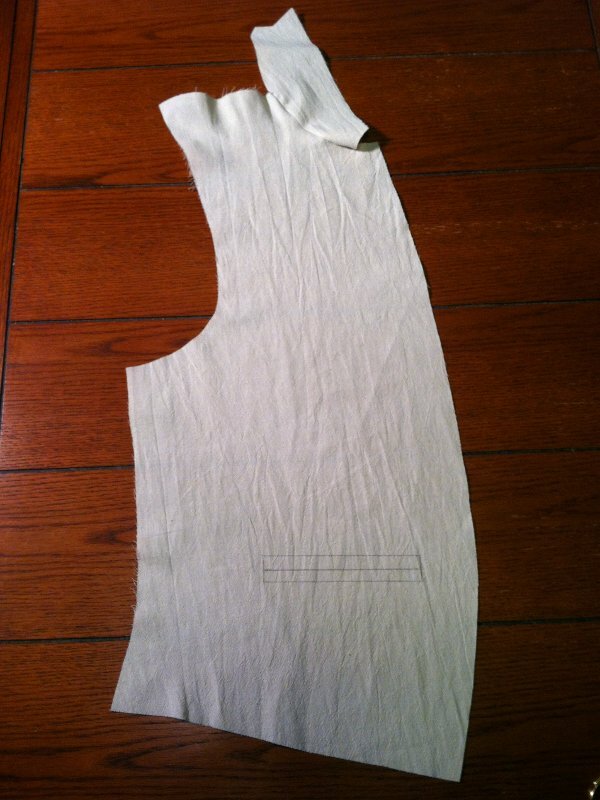 Do not complete this step yet if you are going to add canvas to your garment. 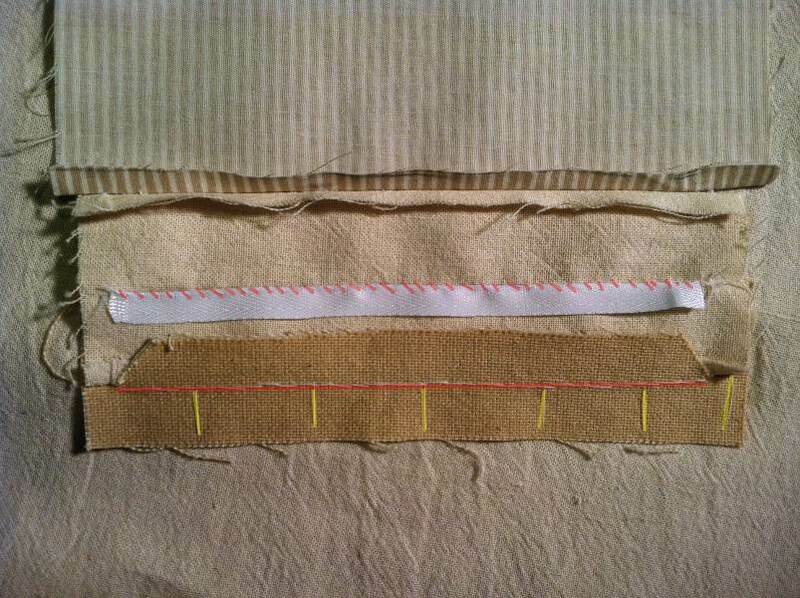 If you are going to add canvas, complete this step afterwards, so that you can stitch through the canvas as well. That will both strengthen the pocket and help hold the canvas in place, which will strengthen the garment. When you are ready, hem in the edges of the welt. 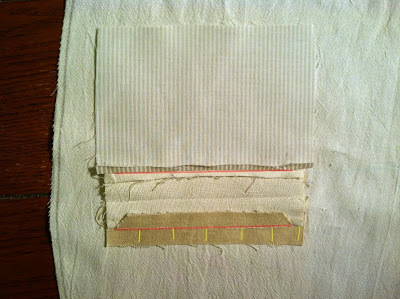 You can trim away most of the fabric that you hem in, so the edges aren't too bulky. Fell the edges, and across the tops ¼" on each side. 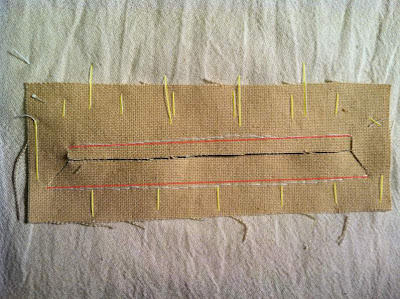 Prick stitch (through all layers, including the canvas) down from the end of the fell stitching, ¼" from the edges. In this picture I've prick stitched the edges instead of felling, but that's because I didn't read the directions properly. 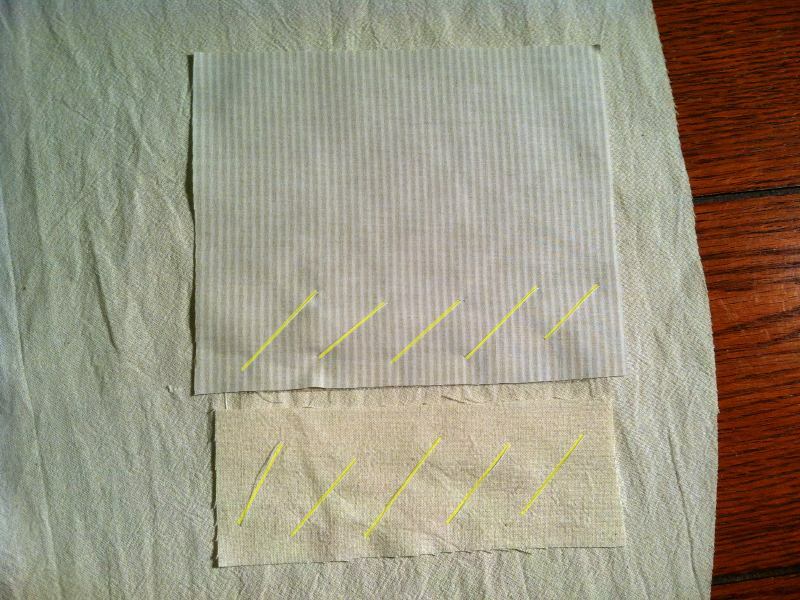 It will look better if you use invisible fell stitches, and then prick stitch like you should ¼" from the edges. And there's your finished welt pocket! Repeat 100 times so you don't forget how to do it, and don't take 4 hours to do it like I did, interspersed with cursing. Very cool to see the process. Btw, the final result will look neater if you cut very thin, long triangles out of the sides in the part where you say "Do not cut into the welt." That didn't make much sense, but step 5 on this site explains it better. 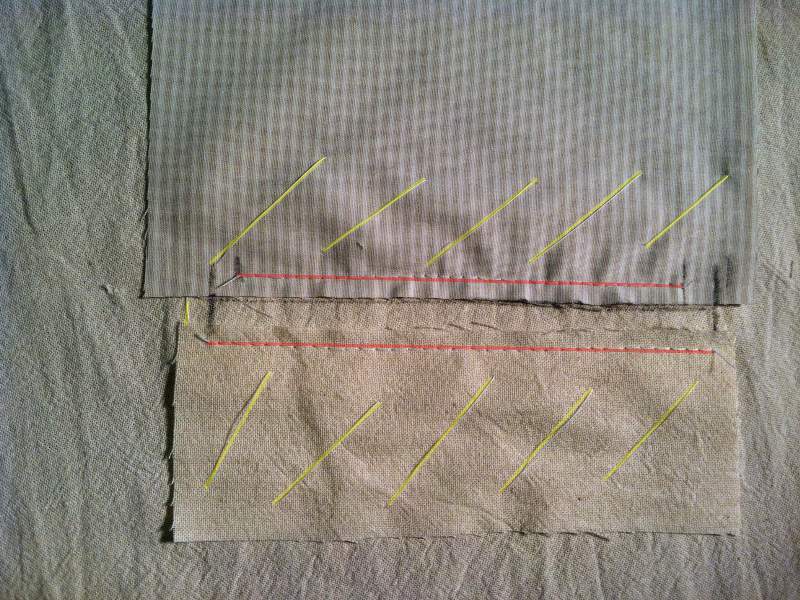 I have done that with other styles of single welt pockets, but you'll see that in this tutorial that triangle is there but not equal. 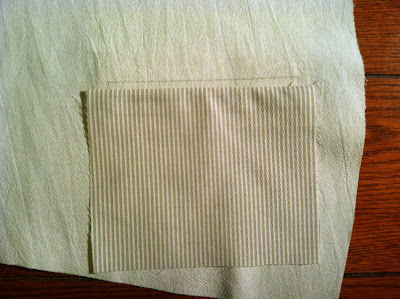 The top pocket is not sewn across as long as the bottom welt, so you don't get a thin triangle at all - you cut straight up to the end of the top pocket seam. 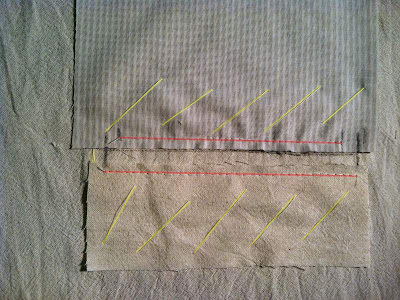 That makes an obtuse triangle, and makes it so that the welt is much easier to sew up to the fabric at the end.